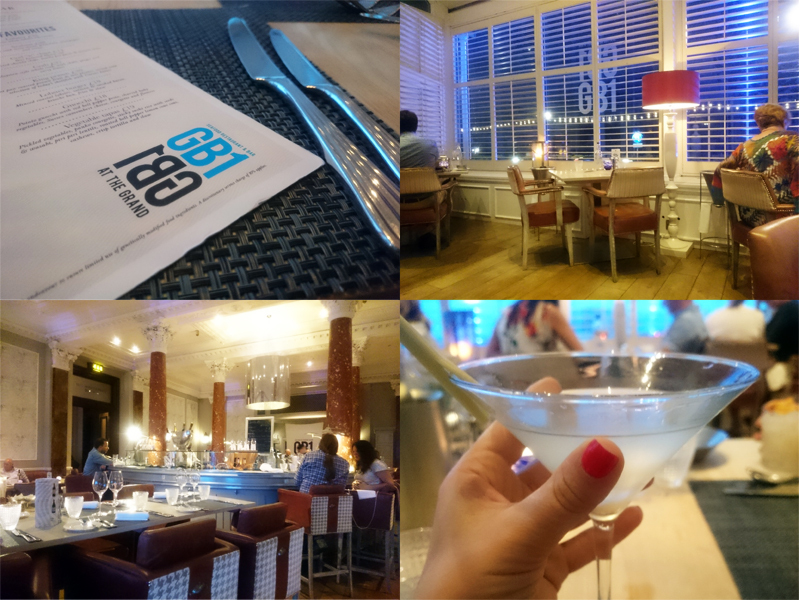 It has been a while since my last visit to GB1 and although the quality of restaurants in Brighton has improved quite a lot in three years, it was nice to still be impressed with the venue of this restaurant, which is part of the glamorous Grand hotel. Brighton still falls very short of fine dining options in the city and whilst I love our quirky and low-key attitude, sometimes I just want a bit more formality. Pressed table cloths, well weighted cutlery, high ceilings and dammit, someone serving me that is wearing a matching pair of socks and doesn't have facial tattoos. Here, its all shiny marble, with a magnificent central bar that you can prop up with an ostentatious seafood platter and a bucket of champagne. This time I was seated in the sea-view conservatory but this was just as pleasant. I think I'm there with oysters now. I believe you can train yourself to like certain foods and I really struggled with them before. 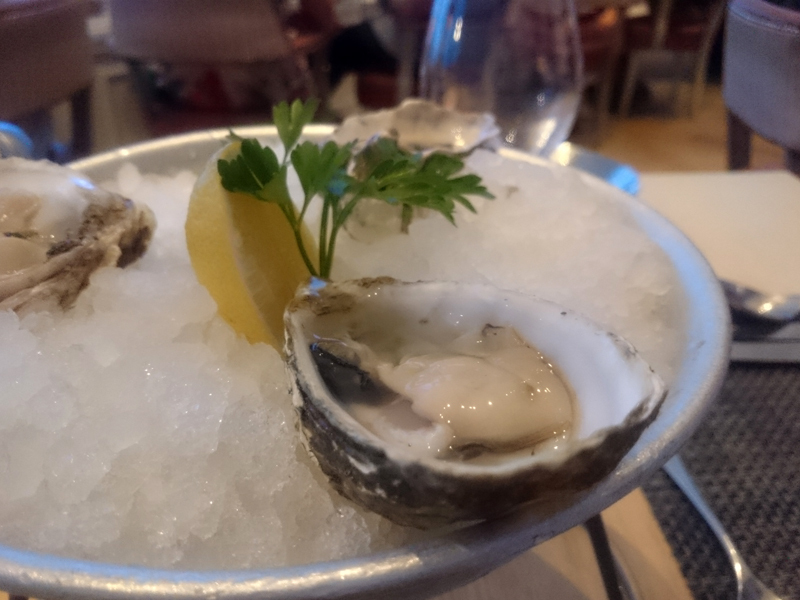 Every time I see them, I order one, goaded by my oyster loving husband. This time I genuinely enjoyed them with the dressings. The education I got at English's of Brighton certainly helped and I'm training myself to like the squidgy Mersea variety next. 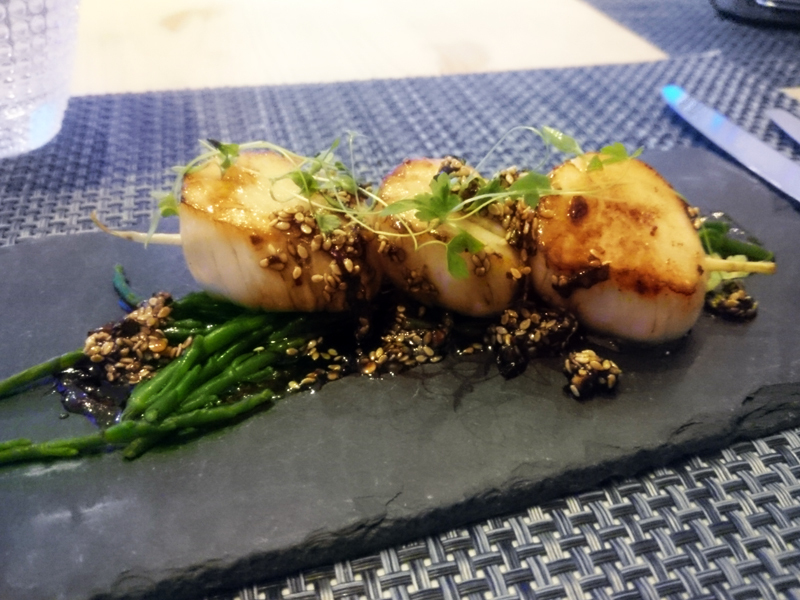 Scallops were plump and sweet and the Asian influence of mirin, sesame and coriander complimented them beautifully. They were not undercooked either (pet hate). 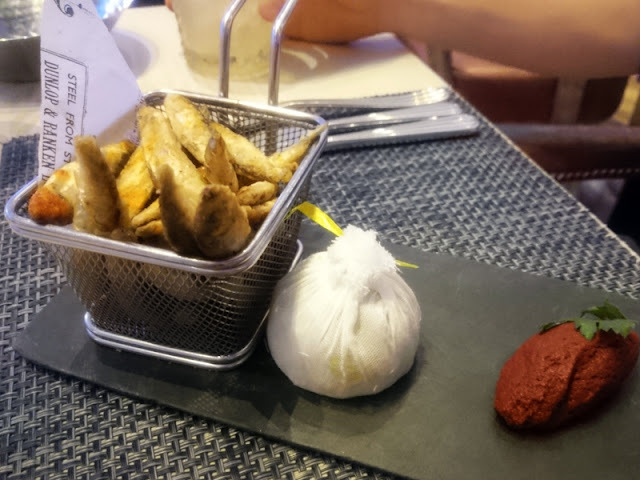 Regular readers will know my feelings of slate and I was really disappointed to see them served on this glorified building material, along with the irritating little mini fryer baskets. Now these items have filtered down to chain pubs and the like, it cheapens the presentation and felt a little dated and lazy. It just jars with the rest of the surroundings and concept. Shame. The whitebait could have been crisper but the spice added to the coating was a nice touch. My brill was indeed brill (soz). 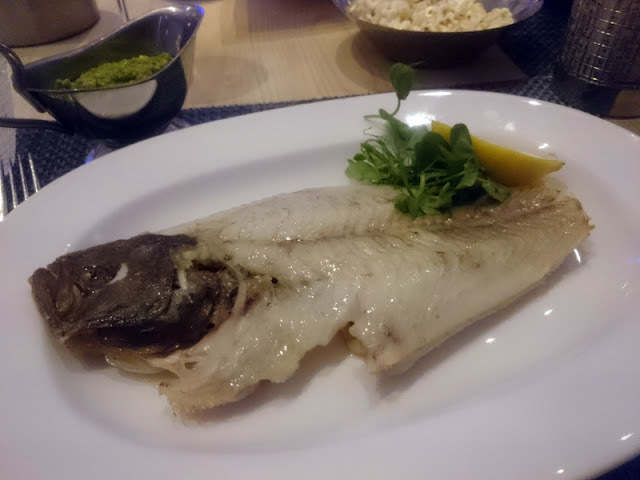 It's a heavy, meaty beast with sweet, firm flesh and a bit like its more expensive cousin, Turbot. Served simply grilled, the natural flavour was allowed to shine through and I enjoyed the lot. 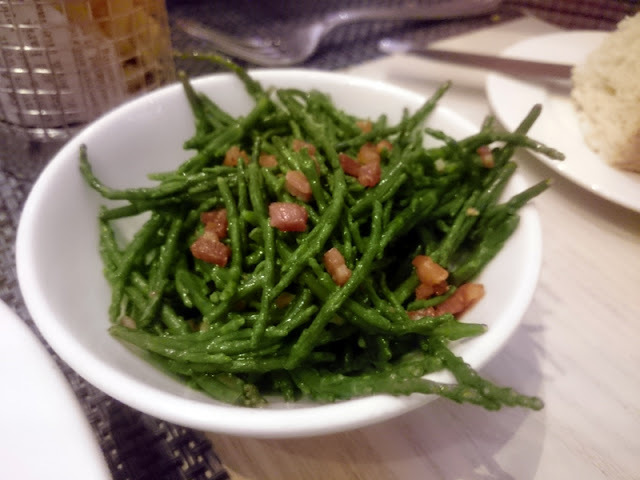 I added some samphire and bacon as well as a pea, cashew and coriander pesto. Although the GB1 "favourites" including THE lobster burger are all complete, the sides, sauces and extra shellfish for the fish and meat grills are priced separately, which is fine, but you do run the risk of concocting a strange meal. 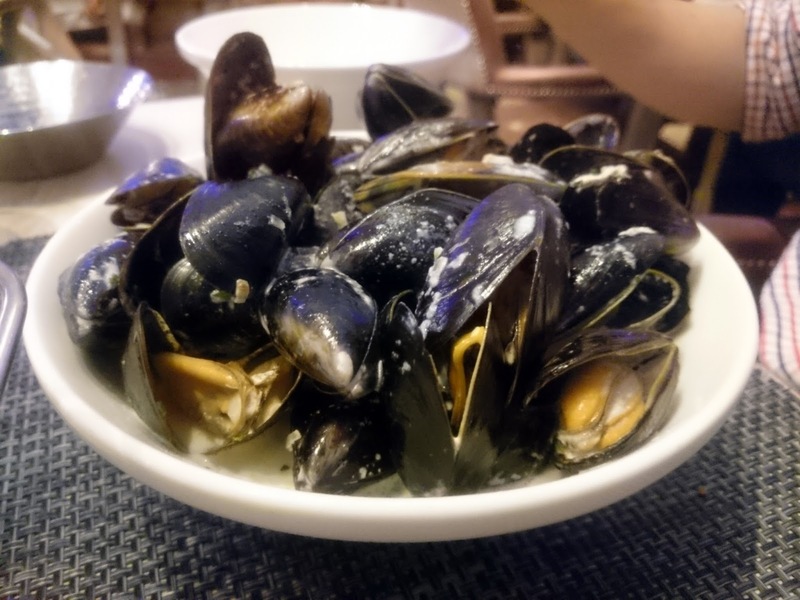 The huge portion of Moules Mariniere went down well enough too. When is cream, butter and wine never a good idea? My bread head husband wanted some to mop this up and we had to order the bread and popcorn on the menu to get this. Personally I'm not sure why anyone would require bread and popcorn together but the scallop dust on the corn was really interesting, but maybe with a beer at home. Wines weren't as pricey as you'd expect. You can go to town here obviously, but there are plenty of options that are affordable and by the carafe or glass. The crisp, fruity Sauvignon Blanc that was recommended, was perfect with the meal. The desserts here are clearly still very good, I remember being particularly impressed with them last time. 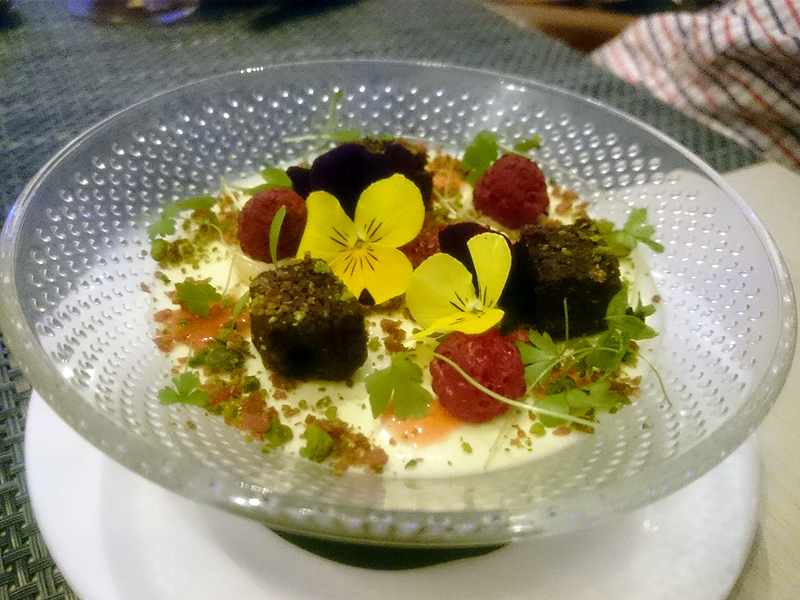 I ordered a beautiful orange panna cotta, which tasted as good as it looked. Thick, smooth, silky and decedent with a perfectly pitched citrus flavour and the decoration, for once, accented the dish. The sharp dehydrated raspberries and the small cubes of chocolate cake were unexpected but worked really well and pistachio always loves orange and added another layer of texture. I usually struggle with dessert choice, not having much of a sweet tooth and never wanting chocolate, but here there were plenty of options I would have happily ordered. Service is super slick and so much better than my last visit which was quite anxious, like everyone had just completed a huge flip chart training course or been given an almighty bollocking prior to hitting the floor. We were given a choice of tables (being really fussy about seating is one of my many quirks, so this appealed), referred to by name as we were seated, given a little ticket for the cloakroom and all with a friendly but smart delivery. There seems to be this need for restaurants to have a quirk or a concept now but I still think it's good to have dining options that are special in the traditional sense. The good food here will appeal to a wide range of diner and has enough interesting tweaks and detail without going too far. You'll need to dig a little deeper than your pocket money to dine here but it's well priced for the quality and setting. If you haven't already, I say dust off your finest and head on down there. I booked via Open Table which was a simple interface and no need to register if you don't want to. Plus my booking had obviously worked and the email reminders were handy. They also offer gift cards. Who doesn't want the gift of food? Exactly. This post was sponsored by Open Table. Words and thoughts, as always, are my own.